She started crawling fluently this week. There is a big difference between dragging yourself with your arms (mopping the floor with your belly) and actually moving palm-knee-palm-knee (belly completely off the floor). She goes where she hears voices. She goes where she's never been. She is very curious about the laundry room and 1/2 bath towards the back of the house but she seems to know she's not allowed over there. She pulled up onto that coffee table to reach a toy she spied. She got it. This marks her first time pulling up onto furniture. After five minutes in this position she cried because she realized she couldn't get herself back down to the floor! This means we have to take the crib apart and lower the mattress. Why they make it such a hassle, I don't know. 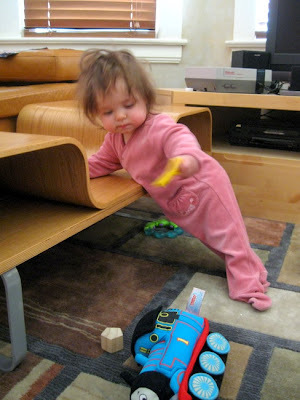 But she pulled up holding onto the crib rail this afternoon so it must be done. 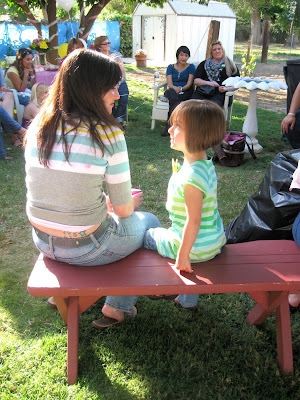 Last weekend, the girls and I attended Cousin Jenny's baby shower in Grandma Emma's backyard (my favorite backyard in the world). I brought Maxine's walker in case my arms needed relief but as soon as I put her in it she threw a fit. Grandma came and picked her up and she stopped crying. 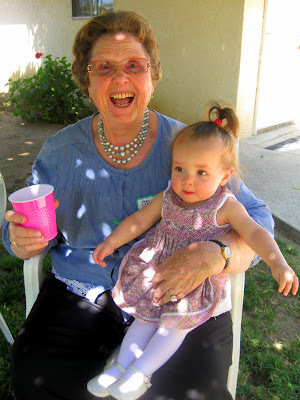 She stayed on Grandma's lap for a long time, talking, grabbing buttons and beads, nibbling her little shoes and being plain adorable. The affair was catered by Brent's Deli which is WAY better than Subway--not even comparable. So I ate lunch while Maxine played with Grandma and then we switched. 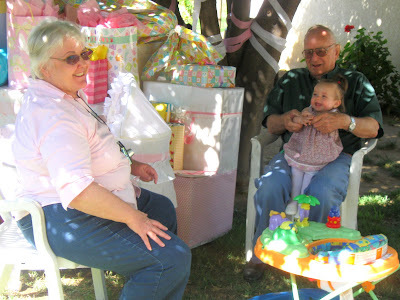 Later, Maxine also spent a lot of time on Grandpa's lap, equally at peace and equally playful and adorable. She already knows and likes her great-grandparents, huh?! Raquel at this age was the opposite--she couldn't stand Grandma. It brought a lot of joy to Grandma that Maxine was so happy on her lap. 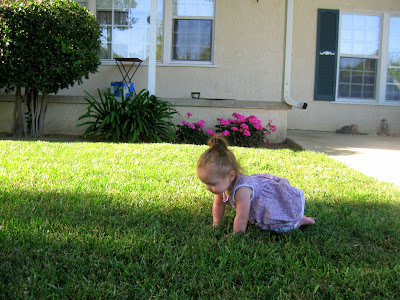 Here's Max trying out the grass in the front yard. She tried to eat it. 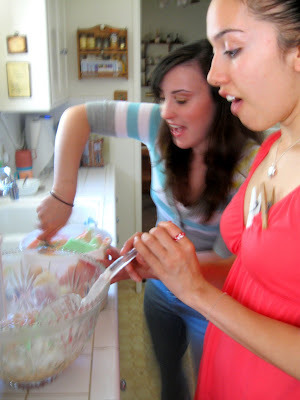 Cousin Mary made Rainbow Sherbet Punch that was so pretty! I didn't try it but Maxine did, hehe! Grandma was giving it to her and she liked it so much she tried to pull the cup to her mouth for more! She didn't get a sugar high or a tummy ache, just so you know. Raquel socialized with everyone and played all the shower games. 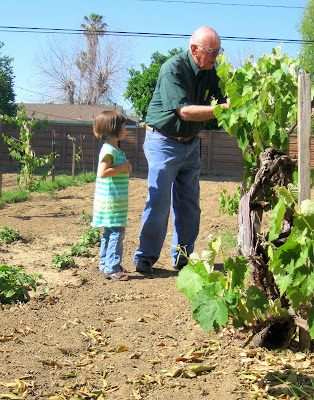 Grandpa gave her a mini agriculture lesson in the vineyard. I took several shots of this. I don't want Raquel to forget these things. WOW. those are some really nice pictures and better yet some great memories! those girls are very very cute! i love them so muchies por el tambachies. I compare Maxine to Raquel all the time. To me, they look so much different! 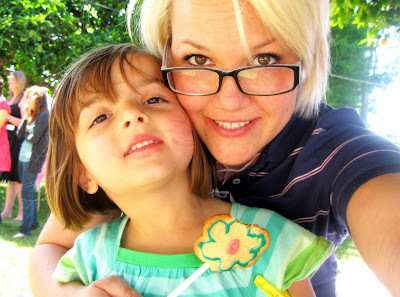 Obviously it's because I'm their mom and I have seen them both through baby-hood and the little changes that happen. 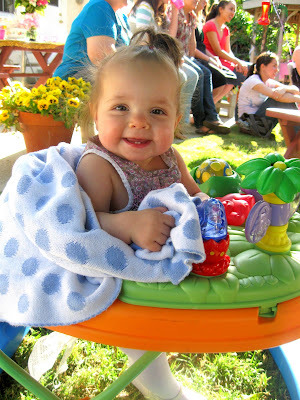 Jose and I always used to wonder how we'd ever make a baby prettier than Raquel. We ALWAYS used to talk about it (before Maxine was conceived). But now I realize it's possible to have 2 daughters equally breathtakingly beautiful and charming in THEIR OWN separate ways. I realize it sounds cliche. hey, those are really nice pictures! is that straight from your camera or do you edit them? I do edit my pictures. The tiniest edits make a big difference. I manually adjust the light/shadows to create more contrast, sometimes I slightly saturate colors and I also crop them. 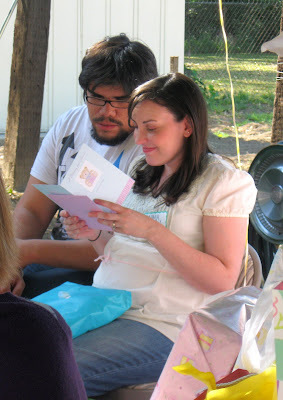 I took tons of pictures at your baby shower. When I get around to editing them, I'll send them to ya!